The Minnesota Wild will again be playing with out the services of winger Jason Pominville when they face the Ottawa Senators on Tuesday. It’s a significant absence for the Wild as they battle the Colorado Avalanche for the eighth and final playoff spot in the West. 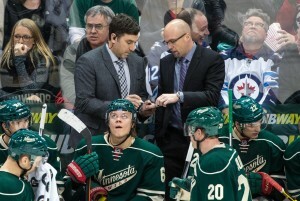 Though Pominville has had a, to put it mildly, trying season, he’s been vastly improved under new coach John Torchetti. Or, at least the results have been there under Torchetti. Pominville has skated on the Wild’s most productive line since the coaching change, with Erik Haula at center and Nino Niederreiter on the other wing. In the 12 games all three have been on the ice under Torchetti, they’ve combined for 14 goals and 31 points. In those 12 tilts, Pominville has contributed five goals and 12 points for a point a game average. Under Mike Yeo, Pominville scored six goals and 15 assists in 55 games. That’s just 0.38 points per game. As a raw total per game, that’s the worst rate he’d posted in his career. But the question heading toward the postseason is how Pominville got to this point. Has he truly been reborn under new leadership, or is it smoke and mirrors over a small sample? The results certainly look good, and have come in reduced time. He’s only played more than 17 minutes twice under Torchetti. Overall, he’s averaged about 1:30 less ice time per game at even strength and is seeing a half-minute less power play time per game. Getting the results he has in reduced time would add to the idea that he’s really bounced back in a big way. However, Pominville’s success may not actually be coming because of improved play, but because he was bound to bounce back with how he was playing. He was shooting just 3.3% at even strength under Yeo. That’s very, very low for a guy who has shot 10.9% over the course of his career. Under Torchetti, he’s shooting 16.7%. That regression wouldn’t be such a big deal if there was evidence that his game is vastly improved. But his production appears to be a combination of that shooting percentage regression — frequently an indicator of “puck luck” — and playing on a line for whom everything is clicking. Pominville’s shots per game are actually down under Torchetti. He’s averaging 2.17 shots per game where he had been up at 2.62. That seems reasonable given the reduced ice time, but a closer look reveals that the underlying numbers are down as well. At even strength, Pominville is take two fewer shot attempts per hour under Torchetti. His individual Corsi is now 12.5, where it had been up at 14.4 under Yeo. In that small of a sample, it’s anything to panic about. It’s a small gap. However, it doesn’t reveal a player whose play has been elevated over the last stretch. His relative possession marks are vastly improved too, but, again, this isn’t because of wildly improved offense. Under Yeo he had a score-adjusted CF%Rel of 4.5% (meaning that the team was getting a better shot attempt differential when Pominville was on the ice compared to when he was off the ice). Under Torchetti that’s an even stronger 9.7%. This, again, is partly due to the sample size. A small fluctuation — or playing weaker teams, even — can create a large fluctuation when you’re looking at so few games. But while it’s difficult to make sweeping judgements about his possession play in a 12-game sample, his rise isn’t because of improved offensive attempts. His Corsi For per 60 minutes actually fell from 58.4 to 56.4. It’s the Corsi Against per 60 minutes that has improved, moving from 55.4 to 47.9. Importantly, that’s happening with a not insignificant usage adjustment. On a line with Mikael Granlund and Zach Parise, his zone starts were quite insulated, starting 63.2% of his shifts in the offensive zone for a relative offensive start percentage (ZSO%Rel) of 16.8%. On Haula’s line, Pominville is seeing heavier defensive deployment with only 42.6% of his shifts beginning in the offensive zone, for a -3.3% ZSO%Rel. Meanwhile, despite being in the defensive zone more frequently to start shifts, the shot attempts against the Wild while Pominville is on the ice have gone down. Pominville was certainly due a little puck luck after starting the season snake-bit and having things rarely go his way. But there’s also an illusory element to the idea that Pominville is suddenly a new player. He’s essentially the same player getting the bounces and may even producing a little less offensively — in terms of underlying numbers — than he was under Yeo. That’s not an indictment. Results are good and we are talking about two shot attempts per 60 minutes, which is less than one shot attempt per game. It’s not a significant drop, particularly when taken in conjunction with an 20.6% shift in zone starts toward the defensive end. What’s remarkable is the improved defensive play on a lesser line and facing similar competition (TOIC% went up 0.3 under Torchetti, while CorC% went down 1.2%). Offensively, where Pominville has been dogged most this season — and not undeservedly so — the results had been abysmal. Yet his underlying performance wasn’t as bad as the results indicated. That’s not to say that there weren’t stretches were his play was poor. There were. But there were also stretches where he played quite well and just couldn’t get the puck to go. Now it’s inverted, his performance isn’t as great as the storyline goes. For better or worse, the results are different, but the performance in the offensive zone hasn’t changed much. RELATED: Are the Minnesota Wild a Playoff Team?